Established in 1980, B.A. Ramirez & Sons Ornamental Iron Works, Inc. offers Encinitas the best value in ornamental and wrought iron work. We specialize in custom designing, fabricating, and installing iron fences, handrails, guardrails, staircase railings, gates, doors, and window bars. Additionally, we offer expert repair and replacement services for broken, rusted, or damaged iron fences, gates, and railings. Our craftsmen provide iron work services of the highest caliber at affordable prices to our Encinitas commercial and residential customers, and have decades of experience in providing high-quality workmanship with excellent service. By offering superior iron fencing, railing, gates, doors, and window guards, we have earned more than ten thousands satisfied clients throughout San Diego County. At B.A. Ramirez & Sons Ornamental Iron Works, Inc., providing excellent customer service is extremely important to us. To ensure that we continuously meet our clients' high expectations, our owner is heavily involved with every project, from inception to completion, and stays readily accessible to every customer. B.A. Ramirez & Sons Ornamental Iron Works, Inc. is licensed, bonded, and fully insured. We also back our steel construction with two-year material and labor warranties. At B.A. Ramirez & Sons Ornamental Iron Works, Inc., our craftsmen are experts at window guard and door fabrication and installation. They can design almost any type of iron security door or window guard and offer Encinitas home and business owners a wide selection of customizations to choose from. Options include tube or solid iron bars, hammered iron bars, heart scrolls, leaf castings, protective coatings, attractive finishes, color matching, and much more. Additionally, because our craftsmen boast a high level of artistic ability, they are fully able to custom-design windows and doors that will enhance the look, value, and curb appeal of your home or business while also meeting your security needs and budget. Call us today and take advantage of our free onsite consultations for window guards and doors in Encinitas. Trust B.A. 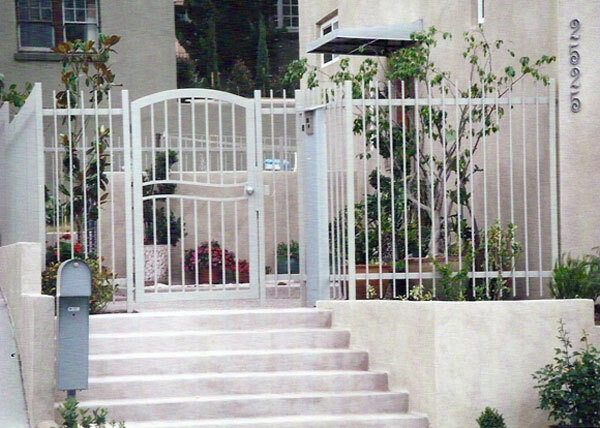 Ramirez & Sons Ornamental Iron Works, Inc. to expertly design, fabricate, and install your Encinitas iron gate. Our highly skilled and experienced craftsmen pride themselves on adhering to only the highest standards of quality workmanship, and build all iron gates to last. No matter what your taste or budget, we can design and custom-build the perfect iron gate for your Encinitas home or business, whether you need a minimalistic garden gate or an ornate driveway gate. Any of our gates in Encinitas can be turned into an automated gate by adding a gate operator system or a security access gate by adding a phone entry system, keypad system, card reader, proximity reader, or other state-of-the-art access control equipment. Call us today to install a custom iron gate at your Encinitas property. B.A. Ramirez & Sons is the best choice for those in Encinitas who are interested in having an automatic gate installed in their driveway. We have more than 30 years of experience crafting beautiful ornamental and wrought iron gates, and are experts in the best ways to configure them using today's state-of-the-art automated gate equipment. We frequently sell, install, and repair gate operators and access control systems made by All-O-Matic, Linear, RamSet, LiftMaster, DoorKing, and Elite, but are capable of working with nearly any major gate operator brand. With our extensive industry knowledge and skill, we are able to ensure that you get the right motor for your gate; your gate has the safety features necessary to protect people, animals, and vehicles from getting trapped or damaged; and your completed gate functions exactly as you wish. Call today to learn more about our automatic driveway gates for Encinitas residential and commercial customers; online estimates are free. At B.A. 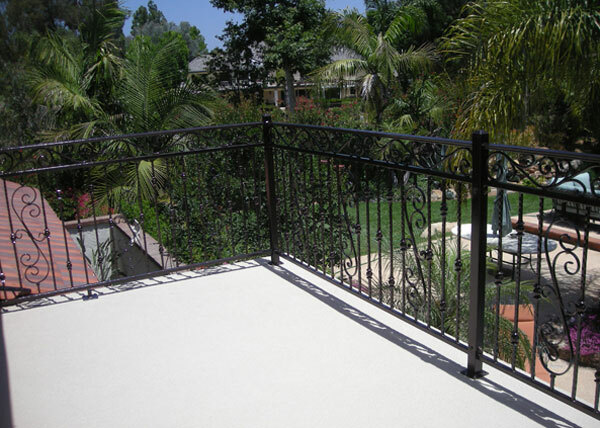 Ramirez & Sons Ornamental Iron Works, Inc., we custom-design railings for balconies and stairs, handrails which meet with ADA requirements, and guardrails for residential and commercial client throughout Encinitas. We offer a wide selection of options to customize each railing: We offer solid and tubular iron, anti-corrosion coatings; hundreds of attractive colors); and hand-forged iron as well as castes iron elements. By offering fully customizable ornamental and wrought iron railings, we are all to meet our customers' individual functional needs, aesthetic preferences, and project budgets. In every case, our completed railings are sanded, grinded, and buffed to achieve a flawless finish, and backed by a two-year warranty. Call us today. Choose B.A. Ramirez & Sons Ornamental Iron Works, Inc. to custom-design, build, and install any style of iron fence you desire for your Encinitas home or business: from a simple, affordable, and primarily functional iron fence to a highly designed, ornate iron fence and gate with state-of-the-art operator and access control systems -- the possibilities are limitless. Our highly skilled and experienced craftsmen pride themselves on adhering to the highest standards of quality workmanship, complying with relevant building codes, and making each fence to last. We offer tubular and solid iron. Our fences are hand-forged, welded, then given a rust-prevention coating. Call us today to learn more about our iron fencing installation services for Encinitas. Look no further than B.A. Ramirez & Sons Ornamental Iron Works, Inc. for all of your custom iron work needs in Encinitas. Give us a call and our talented professionals will help you design the ideal iron fence, gate, railing, security door, or window bars for your residential needs at an affordable price. Our ornamental and wrought iron work is known for being beautiful, functional, and long lasting, making it ideal for custom pool fencing, front yard fencing, privacy fencing, wall toppers, staircase railing, balcony railing, guardrails, handrails, walkway gates, driveway gates, wine cellar doors, security screen doors, window bars, and more. Each piece is designed to complement the property, stay within the budget, fulfill the specific needs, and comply with current building and safety codes. Choices include tubular or solid steel; hot-dipped galvanization, baked-on powder coating, or metallization treatments; hundreds of colors; countless decorative iron castings; and more. Encinitas business owners love our custom-designed iron fences, gates, railings, doors, and window guards. We have over 30 years of experience, can work within most budgets, and offer a complete range of design possibilities to ensure that your finished iron project will add elegance, style, and value to your Encinitas commercial property. As such, you can make your Encinitas property safer or more secure without having to sacrifice your building's beauty. Our ironwork complies strictly with today's building codes and can meet ADA standards. We offer hand forged tubular and solid iron for all of our commercial iron fences, rails, doors, gates, and window bars in Encinitas, and can embellish these pieces with ornamental iron castings. Design consultations and online estimates are free, so call us today. At B.A. Ramirez & Sons, we are proud to offer commercial and residential customers throughout San Diego County premier ironwork services at very competitive prices. If you are interested in an estimate, call, email, or visit us today. We're also happy to arrange an onsite visit anywhere in Encinitas. F1 This modern steel fence in Encinitas, CA was designed by our client. 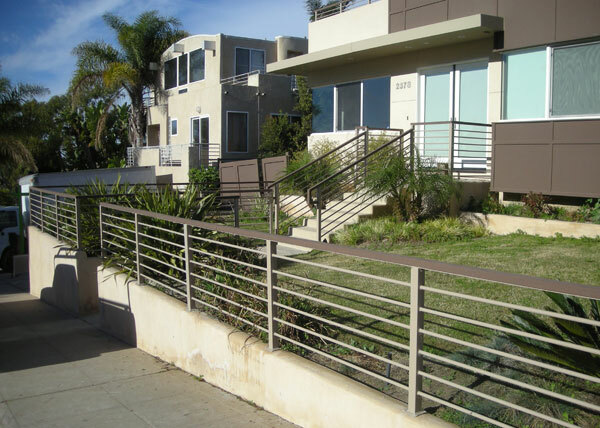 The horizontal rails and wood cap on this custom steel fence give it a very modern look.